When performing Irish music in Virginia, Maryland, and Washington DC, Capital Celtic typically performs as a trio, and occasionally as a duo or as individual solo musicians to suit our clients' individual needs. Steve started Capital Celtic in a Virginia Irish pub in pursuit of his dream to make beautiful music as a tribute to his Irish heritage. His great-grandfather, Edward O'Toole emigrated to America from Dublin in 1888. Steve started his musical journey playing violin at the age of 10. Today he plays acoustic guitar, mandolin, banjitar and harmonica, and provides vocals for many of the group's Irish ballads and Irish pub songs. He has played with several groups from Florida to the Washington DC area and New Jersey, performing live Irish music in pubs, wineries, festivals, weddings, private parties and fundraisers. He also performs as a solo musician throughout the DC area with a regular performance in the Irish Whisper at National Harbor. A native Philadelphian, Steve has lived in the Washington DC area for more than 24 years where he and his wife are the proud parents of four boys. He is a member of the Ancient Order of Hibernians, Colonel Thomas J. Cunningham Jr. Division, Ashburn, VA, as well as Sons of the American Revolution. Kaitlyn Likas (A.KA. The Wild Irish Rose) is an award-winning fiddler and Irish/ Scottish dancer based in the Washington DC area. From an early age, Momma Likas ingrained in Kaitlyn and her siblings an awareness and appreciation of their cultural heritage. As a first-generation Irish American, Kaitlyn makes a point to be active in her local Irish community here in Virginia, DC and Maryland. You might have seen her sawing on strings, and dancing on swords with the well-known Irish sister group, "The Wild Irish Roses." Kaitlyn began her dancing career at the age of 4, learning Scottish Highland dance because Irish was sadly not available in Southern Maryland "back in the day." She later was taught Irish dance in high school from both the Hunt and Broesler schools in Maryland, winning various competitions and championships. Kaitlyn is a self-taught fiddler with humble beginnings as a classically trained violinist. After playing classical for over 10 years, Kaitlyn took on the new challenge of teaching herself the fiddle. Since then, she has not looked back! Kaitlyn is the only female fiddler to perform in the Baltimore-based Irish punk band, The Charm City Saints. The Charm City Saints contributed music to various Irish films and documentaries. Kaitlyn has also recently performed with Black 47, O'Malley's March, Celtica, and The Fighting Jameson's. Her musical inspirations are Lunasa and The Chieftains. Since starting "The Wild Irish Roses," Kaitlyn has performed at several Irish/Celtic festivals on the east coast, including ShamrockFest. She has graced the stages of The Kennedy Center, and various restaurants and pubs. One of the most recent highlights of Kaitlyn's career was performing before Her Excellency, Ambassador to Ireland, Anne Anderson at Fiona's Irish Pub in Kingstowne, VA. In her spare time, Kaitlyn volunteers as secretary to the Ballyshaners, a charitable Irish organization in Old Town Alexandria. She enjoys painting and sculpting, and dreams of opening a Celtic arts school in the future. Kaitlyn currently works as a contractor to the Department of Defense. Jessica plays flute, recorder and also provides vocals for the band. Jess has to thank her high school band instructor who had a poster in the band room saying: “Behold the turtle who makes progress only when he sticks his neck out.” Jess stuck her neck out and tried her hand at playing Irish music on a whim. The result was joining this band. Jess is originally from the Catskill Mountains in New York State. 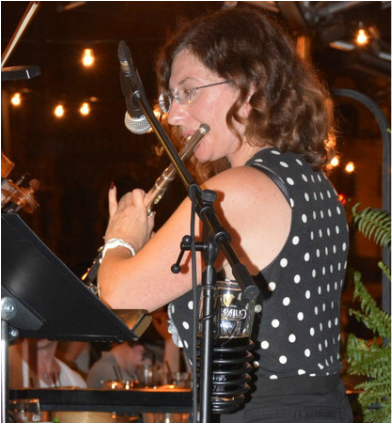 She is a graduate of Rensselaer Polytechnic Institute where she majored in engineering and played in the orchestra as principal flute for three years. After moving to the DC area, she studied for a short time with Vanita Jones, a wonderful flute performer and educator. Jess played flute and bass flute at major venues in the DC area with a group Ms. Jones founded, The Musical Offering Flute Ensemble. Jess has worked in the Information Technology realm for her entire career in various capacities: process engineer, systems engineer, and storage engineer. She owned her own small consulting company which recently merged with another small company. She managed to keep music in her life and passed on this love of performing and listening to both her children. You may hear Jess play and sing at various religious institutions or retirement homes in the Virginia, DC and Maryland area where she volunteers from time to time.